devanét standard plate buckles are designed to be personalised with a logo, badge, symbol or design. There are several distinct processes used to brand our plate buckles all of which produce an exclusive product for the customer. Devanet belts are the only UK manufacturer to offer all these facilities to customers. Devanet will design custom made plate buckles to order for any design. Using a state of the art pateneted diamond engraving machine we can engrave detailed designs or logos on all surfaces including nickel, chrome, brass, mazak, stainless steel and solid pewter. There are no minimum requirements for this process. Pewter badged buckles are custom moulded in solid pewter. This sought after precious metal has a high intrinsic value and can be finished and polished enhancing the apearance of the finished buckle. There are minimum of 25 units for a custom moulded buckle, but devanet have its own propriety designed buckle DVEP shown below where small quanitites can be ordered from stock. Solid pewter engraves beautifully and gives a bright lustre to the engraving of designs or logos. Devanet will undertale one off specials using the standard DVEP buckle. Othe designs are available but a mould charge will be made. Buckles are designed with a recess to acommodate a special resin that hardens like concrete, not like your normal polyurerathane doming resin which is soft. when finished the resin can be sanded and polished. 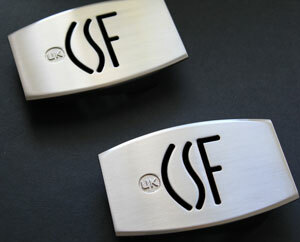 The process is ideal when a standrd inert buckle is used with a 2d profiled badge or when the buckle design is moulded. Devenet use a special eletcro etching system to create a permanent logo or design on the face of the buckle. The process produces clear shap images on any bucles which has a conductive element in it make up. A special nylon stencil is made from a photographic plate. An electrical current is applied to the buckle, it is then elctro etched. The result is a high quaity dark to black image onthe buckle face. Using a galvo laser we can complete the engraving of buckles and the depth of colour by changing the frequency,speed amd power to achive the desired result. Although we will undertake one offs there is a setup fee. This proces is ideal for most metals where an find detail engraved image is required and applied to lacquer coated buckles. The process involves the creation of the logo in a moulding process, painted or polished then bonded mechanically or by special epoxy, this process is ideal for crests, letters or coined shapes as shown in the badged Zamak buckle below. The minimum order for this prcoess is 100 units where one colur is involved and 250 units where mutliple colour fills are required. It is particualarly suited for insert buckle designs. Devanet will design your buckle, tooling will be made and the buckle will be cast in a mould, plated and lacquered as required. The minimum order for a designer buckle is 250 units. Buckles made in this way are unique to the customer, the scope and designs that can be accomodated are substantial and everything including the belt and gift box can be matched. The example below was custom made for a customer. Buckles specially designed with inserts so that full colour logos can be applied and dome filled with a polyurethane clear resin. Full colour logos, designs and metal inserts can be used to full the inserts with good effect. Standard insert sizes are 51 x 30 mm and round insert size of 20mm diameter for golf ball markers. Custom insert buckles and shapes can be made to order so tuist a particular logo or design. Minimum orders will apply 25 units for standard dome inserts amd 250 for custom made buckles and inserts. All images are purely for illustration only to show then processes & not for sale.